Mexican "huevos con recaudo" are simply scrambled eggs cooked with tomato puree. The resulting taste, however, is unexpectedly exceptional! This is a true breakfast favorite. Garlic is quickly sauteed in hot oil and combined with tomato puree. Whisked eggs are added to the hot skillet and quickly scrambled along with the garlicky tomato sauce. The scrambled eggs can be enjoyed on their own or inside a warm corn tortilla topped with fresh cilantro and slices of pickled jalapeno. No tortillas? No problem! These Mexican huevos con recaudo are also very nice when served with a fresh baguette sliced into 1/2 inch thick rounds and lightly toasted. Per Serving: 405 calories; 19g fat; 42.3g carbohydrates; 19g protein; 373mg cholesterol; 539mg sodium. 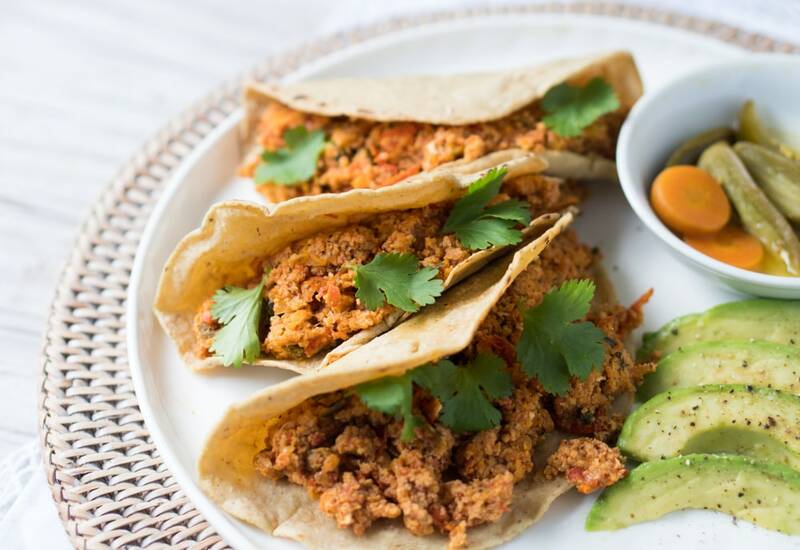 Made these tacos for breakfast today and really liked them! The flavor of the pickled jalapenos was a nice bite against the creamy avocado and tomatoes. I even added some chorizo to mix. Yummy! These were super yummy! I didn't serve them with tacos, but instead ate them with a side of turkey bacon. It was really good, I can't see myself making eggs any other way now.